Sale! Float In Huge Infinity Pool On Ocean, Large Terrace, WiFi, Steps to 5th Ave.
SALE! 2 Master Suites, Large Pool, On Beach, Terrace, WiFi, Maid, Right in Playa!. Spring Sale: 20% off Apr. 1 - Apr. 23, 2019. Was $300 Now $240 p/n! Bright, elegant & well located are a few words to describe this splendid condo at El Faro Residences in Playa del Carmen. Located directly on the beach, downtown, and overlooking the turquoise Caribbean Sea. Beautifully decorated & situated pool-side on the main level, which is ideal for families or those with mobility issues. One of the main highlights of our condo is the spacious private terrace with travertine flooring, and partially covered with an overhang for both sun & shade. The patio has lounging furniture, tropical potted plants, and a table & chairs to dine alfresco & enjoy those ocean views! The living area is bright and artfully decorated with a flat screen TV and Sony sound system, satellite TV, & DVD/CD players. The space enjoys elegant rattan couch and chair with coffee table. Enjoy the views even from the couch! Slide open your doors to the soft breeze of the Caribbean. Both bedrooms are spacious with king bed and adjoining deluxe bathrooms (No one will be fighting over getting the 'master bedroom'!) Master bedroom has sliding doors to terrace, a walk-in closet, with safe. The full bathroom with marble accents has a large glass shower with rain head. Guest bathroom enjoys marble accents and a glass shower with rain head. A small pull-out sofa bed in the entrance area can accommodate a small person. Playa del Carmen is an international vacation spot welcoming people from all over the world. A charming sea-side town with a fun vibe. Steps away is shopping, restaurants, beach clubs, water sports, art galleries, spas, boat tours, para-sailing, jet ski rental etc. Close by are ancient Mayan ruins, zip-lining, snorkeling, scuba diving, eco waterparks and more. Playa enjoys a lively day-time beach scene with live music, followed by a laid-back night-time scene with live music, fire shows and candle-light dining by the ocean. We are more than happy to arrange your private transportation round trip via van for up to 10 guests + luggage for a very reasonable fee. Should you wish to do day trips & tours, we can also assist you with that. El Faro is a trendy fun vacation spot considered by many to be one of the best beach scenes in Playa. 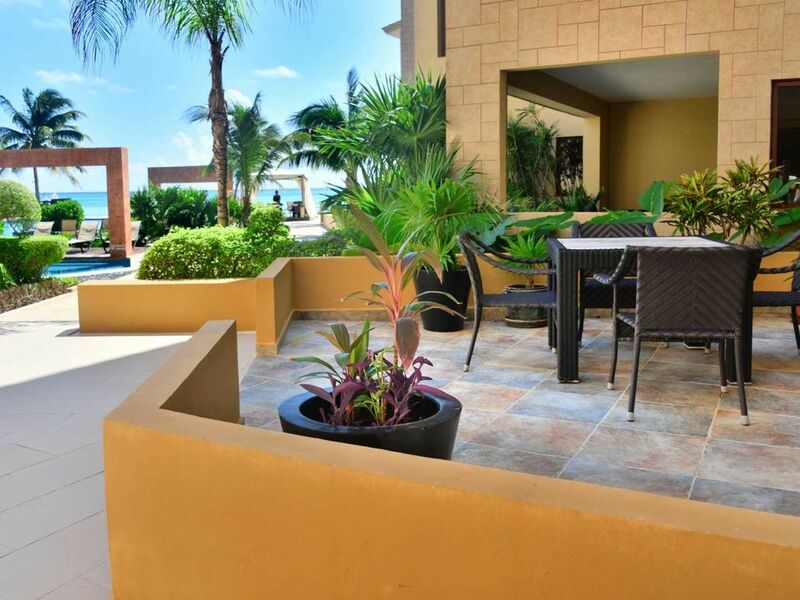 Welcome to El Faro and welcome to our condo offering you the ultimate in tropical vacations! 20% Off Valid Apr. 1 till till May 31, 2019 for stays ONLY during those periods. Nightly rate is discounted and reflected in your rate. Some terms & conditions may apply. *Upon arrival at EF, please check in at front desk to retrieve your keys. *If you require on-site parking it is $15USD a day (subject to change). You will need to fill out a parking request form. *Playa is a walking town so a car is not necessary. *Walmart is a few blocks away. *Taxis are readily available around Playa. *There is on-site massage ($extra) or beach massage on the beach for a really cheap price. Bring US dollars. *Bring pesos with you to get started. Only use ATMs attached to a bank. Do not use street ATMs. *If you wish to smoke on the terrace, please ensure all condo doors are closed. *For protection of our beach & ocean, ensure cigarette butts are safely removed and placed in a container if smoking on the beach. *For the enjoyment of all, please keep music/noise to a minimum. The chic, resort-like atmosphere offers all amenities and services one could possibly desire such as a large tropical infinity pool, on-site massage (extra), 24 hour security, and steps to the beach. Beautifully decorated with a large terrace mere steps to the pool. Right in the heart of Playa del Carmen, with half a block to lively 5th avenue! Mere steps to beach clubs and restaurants. El Faro is ideally situated in the heart of the city, only steps away from a limitless array of options for dining, shopping and entertainment. After a day of soaking up the sun at the exclusive beach club, guests can meander a half block to the world famous 5th Avenue and experience a delectable variety of local and multicultural cuisine, live music, and local street performances. Also in the surrounding area, within walking distance, are dive shops, gyms, bus and ferry terminals, tour agencies, spas, night clubs and beach bars featuring incredibly talented local and international musicians. Other amenities at this sought after condo-resort include child minding service, room service, poolside beverage and spa service and laundry service, all for additional cost. I have stayed at El Faro and Corto Maltes many times. This is one of my favorite units as it is ground level (but very quiet) with excellent access to pool deck and Caribbean . Will likely stay at this property in future as next door condo no longer plans to honor access to pool. Great location with short walk to 5th ave's many shops, bars and resturants and Sensi bar next door on beach and new restaurant at Carmen hotel is great. I come down twice yearly. My favorite spot in Mexico for a casual vacation. Very well managed, maintained and security was amazing. Pool was stunning! From check in to check out, we were continually impressed with the level of helpfulness and our pleasant interractions with staff. There was always someone cleaning, patrolling the grounds and keeping a watchful eye on things without being intrusive. The pool was stunning and very clean and beautifully designed. The location was perfect, with restaurants nearby and 5th Avenue less than a minute away. The rooms were great, everything worked and we couldn't have enjoyed our stay more. Thank you for the review! I am so glad it worked out for all of you! Come back any time. Great facility with professional staff. El Faro is a very nice family residence on the beach. The pool deck is very relaxing as it lacks the loud music and partying of an all inclusive resort. Within one hour of my requesting the patio light bulbs be replaced there was a maintenance person working on it. Overall, the staff were courteous and professional. Reef 106 is well appointed, conveniently located and quiet condo with a larger patio for lounging. Great stay. Relaxing, quiet refreshes the soul! Wonderful place that we will love to come back to. Very clean unit. The staff around here is very kind and helpful. The ocean was naughty this trip with the kicking up of the seaweed and piling it up on shore everyday but the crew from the beach worked on it and tried to keep it clear all up and down the beach but it is an endless job. We heard that this happens certain times of the year. Loved that we were close enough to the action and vibe of Fifth Ave but could escape to quiet serenity at our complex. The only thing I will bring back is a king size fitted sheet as they only have a flat sheet for the bottom and it always pulled out of the bottom of the mattress :). Thank you for taking time to write this great review! Not sure why the linen service didn't bring a fitted sheet :) but will follow up with our maid staff on that. Thanks again and we look forward to hosting you again. Excellent dwelling with close proximity to 5th Avenue. Great pool and access to the beach. The condo itself had everything we needed, and our stay was very comfortable! Thanks so much and come back and stay any time! The perfect location in Playa - walk to everything and enjoy the best pool on the beach in Playa!